This outfit is is similar to last week’s in many ways. It follows the same kind of simple formula. This time it’s trousers (instead of a skirt), top and a few accessories to make the outfit more interesting. I love to add texture with accessories and I love the black and white trend, so it features my trusted black and white belt again. It’s a good example of how you can dress trendy without really having to buy too many new things. All of these have been in my cupboard for some time, with these white pants many years old. They have become a new favorite as my trusted sailor white pants have seen their best days. I’m also starting to favor straight legs more rather than the wider bootcuts. As you all know I love wearing white trousers, which is why it is on my spring wish list. The ones featured today have the perfect length to wear with flats but I also need some that I can wear with my heels. Since I like to make outfits more interesting with the right accessories, that is also the reason why I added a graphical bag to the wish list. This particular bag looks great with this outfit, but I would love to have a dressier one in leather as well. Followers of my Facebook page will also have noticed that I coloured my hair again. I asked your advice and showed you the results. However, the pictures did not clearly show the colours and the below picture gives a much better idea. I wanted a a biigger difference between colours, more red and a more streaky look. I felt that my hairstyle is a bit boring and classic and wanted to add more character to the hairstyle. If the reactions on the tennis court this morning were anything to go by, I think I have succeeded. Since I’m not sure what to do with my hair at the moment, I did not have it cut. It’s Chinese new year, which is one of the biggest holidays here in Singapore. I will be in Malaysia’s Borneo and Brunei this week, in search of Orang Utans and magical places, but I have articles planned for the whole week ahead. Hopefully I will have a good internet connection in my hotel so I can stay in touch with you all and keep you up-to-date of my adventures through Facebook and Istagram. I’m also planning to take more pictures this time, so I can write a travel report for this site as well. For now, I’m wishing you a very happy Chinese new year! Love the black and white belt. The whole outfit looks really great on you. Have a fab trip! Your hair looks really fun and pretty, and I think that bag is just great! I’m looking forward to pictures of your holiday outfits and your adventures! You and Helen Mirren both decided to be a “wild child” in the same week! I love the red and blonder streaks in your hair (so fun!) but I really want pink highlights like Helen. 😉 Hubs would just laugh but I am afraid my children might disown me! This outfit is fabulous. The colors are great together and everything fits well. The black and white accessories are the finishing touch. The 3 keys to a perfect outfit – good fit, flattering colors, and polished accessories. Good to see you were not snowed in. And those three keys is something to remember. Hair colour is gorgeous as is the top. Happy Chinese new year. Very stylish, I love the blue on you! It is a perfect outfit. Have a wonderful trip and can’t wait for your report and photos. Love the hair! Love the outfit! The belt and necklace are so stylish. I came across the necklace recently (your article on make up after 40?) and was going to ask when we would see it again! Have a great time in Borneo. I was there in 1997 and visited the Orang Utans. Say hello from me! You look great, that bright blue really suits you, and your hair is gorgeous! White pants are always so fashionable. Love your wonderful belt. Perfect outfit, Sylvia. I love it too. What a beautiful colour of blue. Your hair is fantastic and a great natural shade. Your hair is gorgeous with it’s subtle variations in color. And I love blue, which looks great with your black and white pieces. Your glasses are stunning as well. Hope your vacation is all that you desire! And your hair: yes… you did the right thing. In my opinion. Also looks perfect. This is a great look on you Sylvia! I love cobalt blue and how it’s a flattering color for everyone. Your necklace is so interesting & adds the perfect touch to your outfit! Happy New Year and enjoy your trip! 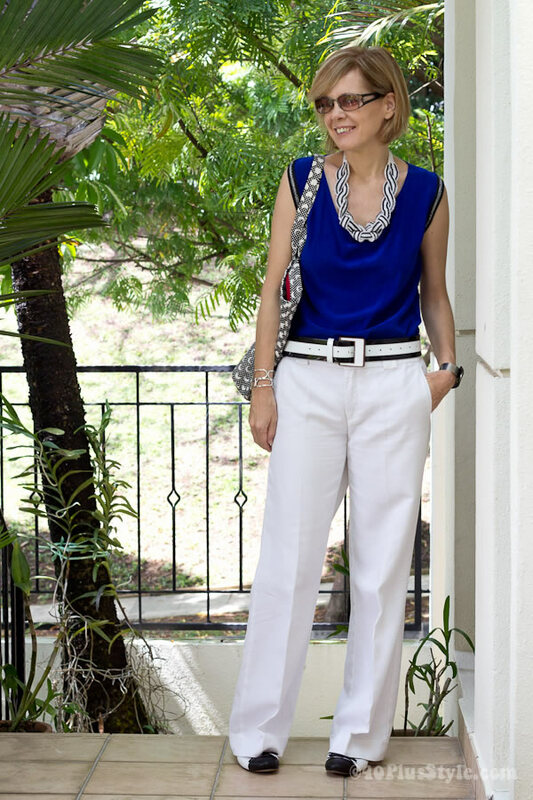 This is a fantastic look, love the cobalt with white and the black & white accessories!!!! Will probably borrow this for inspiration in the near future! I LOVE the color of the electric blue top. The whole outfit looks fabulous but my eyes were immediately drawn to the electric blue. Great look! I love the colour of the top and the shape of the trousers. Your hair is lovely too. I’m getting mine cut this week can’t wait 🙂 Have a great holiday. I’m so jealous that you’re wearing summer clothes! You look GREAT! Love your hair color, too!! S, your hair color is a great new do for spring. As usual you rock bold color with chic white. I favor skinnies over boot cut but your sailor pants have me thinking I may want to try a wide leg for fun. How to wear brights, a hot summer 2013 trend! Previous post: What is a hair spa and how does it work?